The United States' incredible geographic and climatic diversity is on full display in February. While the month is still the dead of winter for much of the country, there are a few places where you can lounge on the beach in warm temperatures above 70 degrees Fahrenheit. Regardless of whether you're hitting the slopes or the sand, February in the U.S. is an exciting, event-packed month. In the United States, the month of February begins with a very odd ritual started in the late 1800s by German settlers in Pennsylvania. On February 2, or "Groundhog Day," we look to see if a groundhog (hedgehog) sees his shadow. If he sees the shadow, the legend holds, then winter weather will last another six weeks (roughly until the first day of spring). However, if the groundhog does not see his shadow, then spring weather will come sooner. No matter what a furry animal says, February is a frigid month across most of the country. It is the last month of winter, after all. However, signs of spring do tend to emerge by the end of the month in most parts of the country. Expect freezing temperatures in New England with snowfall and average lows and highs varying across the northern states like Maine and Vermont to the more southern states like Rhode Island. The region as a whole is known for sporadic temperature changes and out-of-the-blue storms, so be sure to check the local weather channels before heading off on a trip. The Midwest, Plains states, and the states of the Mid-Atlantic also tend to very cold. Winter is typically the rainy season in the Northwest. Cities such as Seattle, Washington, and Portland, Oregon, will see cloudy skies and rainy days throughout much of the month. Snow is common at higher elevations. Milder temperatures are common in the Southeast and Southwest regions. February is when the states of Florida and Arizona begin to host baseball spring training. Fans flock to stadiums in Scottsdale, Arizona, and Palm Beach, Florida, for the sunny skies and first glimpses of their favorite teams. A temperate climate with temperatures above 60 degrees Fahrenheit is usually the norm for Mardi Gras, the end-of-winter New Orleans carnival which generally falls during February. It's hard to provide a standard packing list for the U.S. in February since there's so much regional weather variation. For example, if you're visiting Florida, where temperatures can rise above 70 degrees Fahrenheit, you'll pack differently than you would for colder climates such as New England or the Rocky Mountains. Your best bet is always to pack layers and be prepared for changes in the weather forecast no matter where you go! February may be the tail end of winter and a season when snow or chillier temperatures blanket much of the nation, but it has no shortage of celebrations. Black History Month (All of February): February was officially designated as Black History Month in 1976 by former President Gerald R. Ford. It is a month to celebrate the achievements and recognize the history of African-Americans. Groundhog Day (February 2): This unique holiday has its origins in the German holiday of Candlemas. Today Punxsutawney, Pennsylvania, outside of near Pittsburgh, is the home of “Punxsutawney Phil,” the official weather forecasting groundhog who emerges every February to give his prediction. Superbowl (First Sunday in February): One of America’s iconic sporting events, the National Football League’s (NFL) Superbowl, pits the year’s winners of the National Football Conference (NFC) and the American Football Conference (AFC) against one another. The Superbowl is typically held in a sunny location, such as Miami or Phoenix, and is accompanied by much fanfare, including press events, special days for fans, and tailgating events. Mardi Gras and the Beginning of Lent (As Early as February 3): Mardi Gras (Carnival) festivities are plentiful in the United States, but especially in New Orleans, where the holiday originated. Parades and celebrations will start gearing up during the second week of February. 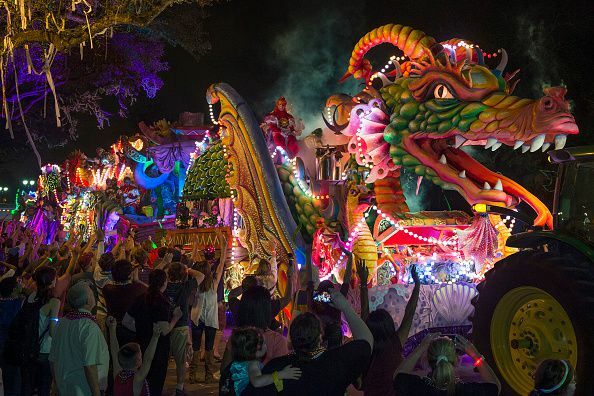 Drinking is one of many Mardi Gras traditions, and it can get a little rowdy, but the city offers a “Family Gras” on the weekend before Mardi Gras. It is a great time to check out a more kid-friendly version of the fun and learn about the other traditions behind the event like King Cakes and costumes. Valentine’s Day (February 14): While not an official holiday, Valentine’s Day is very popular in the United States. Couples spend the day exchanging cards, flowers, and glances over romantic dinners. Presidents Day (Third Monday of February): An official federal holiday—which means that banks, stock markets, and government offices are closed—Presidents Day celebrates all U.S. presidents, past and present. However, the holiday was originally conceived to celebrate the birthday of George Washington, who was born on February 22, 1732. The day was first officially recognized in 1885. The long Presidents Day weekend near the end of the month is a favorite time to plan a vacation to a skiing and snowboarding resort. Destinations in the West’s Rocky Mountains like Snowmass, Colorado, and Lake Tahoe, California, are high enough up that they are reasonably safe bets for great snow throughout the month. Schools across the country typically have a break directly before or after Presidents Day, so it becomes a busy time for travel. If you are thinking of heading out that weekend, make sure to plan well in advance.